Barbara offers a series of Workshops which are highly experiential and interactive, all characterized by a deep personal experience with the transforming energies of The Image Keys and The Chakra Keys. They are always customized according to the size and interests of the audience. The workshops are all intended to Inspire and Empower, via exposure to multi-sensory, high vibrational arts. These include the transforming and healing vibrational energies radiated by the Image Key paintings, complemented by crystals and sacred sounds of crystal singing bowls. Collectively, these energetic tools comprise a new healing modality, The Art of Raising Frequency. Most workshops include the building of energy grids which provide special sacred spaces for meditation and raising Consciousness. The end result is a strong sense of Peace, Joy, Balance and Wellbeing for participants, while the vibrations of pure Love from the grids also radiate to the Heart of the Earth and the Universe. Raising vibrational frequency is key to Raising Consciousness and Connecting with the Love and JOY that is the true expression of our Inner Essence. This empowering workshop is an unforgettable experience. Become immersed in frequencies of JOY as you awaken and strengthen the connection with your True Essence! You will experience innovative tools for Raising Frequency and Consciousness, including Barbara’s own stunning high vibrational art (The Image Keys and Chakra Keys), crystals and the healing, sacred sounds of crystal singing bowls. During the workshop, receive personal, guided messages from Barbara’s amazing Empowerment Cards that assist you to blossom within your daily life. In this introductory workshop, Barbara presents The Image Keys and gives a fascinating, personal account of how she created them, together with a description of their amazing properties and significance for personal and planetary healing. These visually stunning, and energetically powerful paintings interweave sacred geometry, crystal energies and messages from Barbara’s spirit guides – they form the backbone of The Art of Raising Frequency. You will experience their beauty and potential for raising Frequency and Consciousness, and for assisting a deeper awakening of your true and magnificent self. You will learn about the entire Image Key Energy Healing System, and Barbara will also introduce tools that can be used beyond the classroom to guide and support spiritual growth, and help create a vibrant, healthy life. Discover how Barbara’s work can assist your Spiritual Journey at multiple levels, and also help you to Manifest your Dreams! This Introduction is usually 2 or 4 hours. Awaken Deeper Levels of Your TRUE SELF ! This is an experiential workshop in which you become immersed in the vibrational healing energies of The Art of Raising Frequency, and then use these energies to facilitate a deep connection with your True Self. It is this deep connection which creates the insights and awareness that enable you to unlock your Full and True Potential. From within this sacred space, healing energies are sent around the world. It is an experience filled with beauty and wonder. Accelerate the process of personal transformation by taking advantage of supportive energies that can be experienced in this unique workshop. Longer Version (3-6 hours): During the first part of the workshop, you will immerse yourselves in color and sacred geometry through the coloring of Mandala templates created specifically by Barbara to support Awakening, Transformation, Love and Joy. This activity, which is preceded by a short introduction to Barbara’s high vibrational art, will be guided by insights and clarity that have been developed through building energy grids with Image Keys, Empowerment Cards and crystals, all accompanied by the beautiful healing sounds of Alchemy Crystal Singing Bowls. In the second part of the workshop, the Mandalas that have been colored by the group will be added to the grid, thus creating very high frequency vibrations and a phenomenally powerful sacred Temple space which will be used for meditation and transformation. 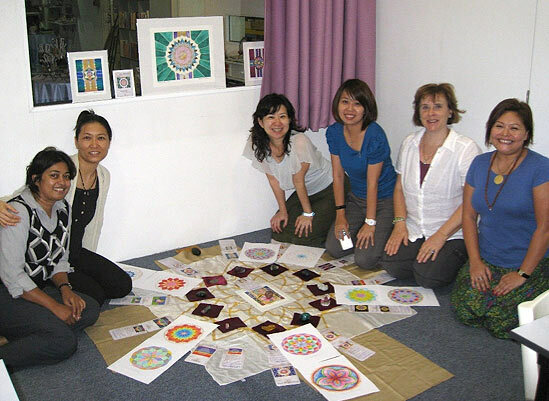 Participants will take home their mandalas and can continue to work with their beneficial energies. This is a fun “hands on” workshop, which offers great potential for major shifts and healing to take place, as you focus upon your personal goals and intentions. Experience the Multiple Benefits of “Taking Your Chakras to New Levels”! Upgrading the Chakras is a vital step for all who choose to be guided by Unconditional Love, and to live in Oneness and perfect Balance. Barbara’s most recent Image Key paintings, the Chakra Keys and associated Chakra Healing Discs, help achieve this by assisting our chakras to clear, evolve, and align with the Fifth Dimensional energies of The New Earth. You will learn about the eleven Chakra Keys currently available, follow the story of their creation, and understand how they focus on clearing and activating the chakras to new levels in order to fully support our awakening process, and enhanced health and well-being.